Price is per 32-inch String of these Beautiful Amethyst Chip Beads, OR one double-length strand of 32-inches - ready for stringing. Each 7mm. 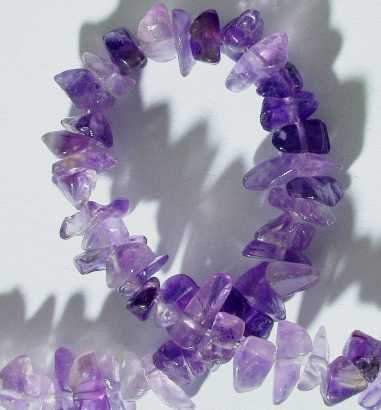 Amethyst is an especially powerful stone. It reduces negativity and brings spirituality - hence the name "Pope Stone". A stone of divine love. Linking with the zodiac is is often used to help psychic knowledge. Aventurine also belongs to the quartz family. Although sometimes called “new jade”, aventurine often has inclusions (due to green fuchsite mica) which creates a speckle, differing from genuine jadeite. Spiritualists believe aventurine has the ability to purify the spirit and bring balance to male and female energies. Its capacity to calm and bring inner-peace makes aventurine a very important stone in the spiritual realm. Green is the color of healing - with aventurine the all-purpose healer. Not only good for physical disorders, blockages and migraine, but also healing on all levels.